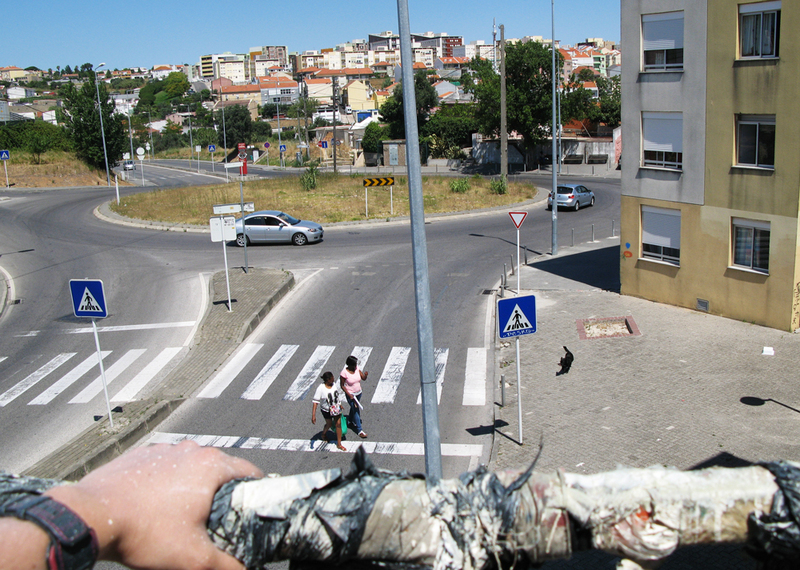 The project ”Quinta do Mocho” takes place in the suburbs of Lisbon, in Loures, where a community of migrants lives with difficulty. 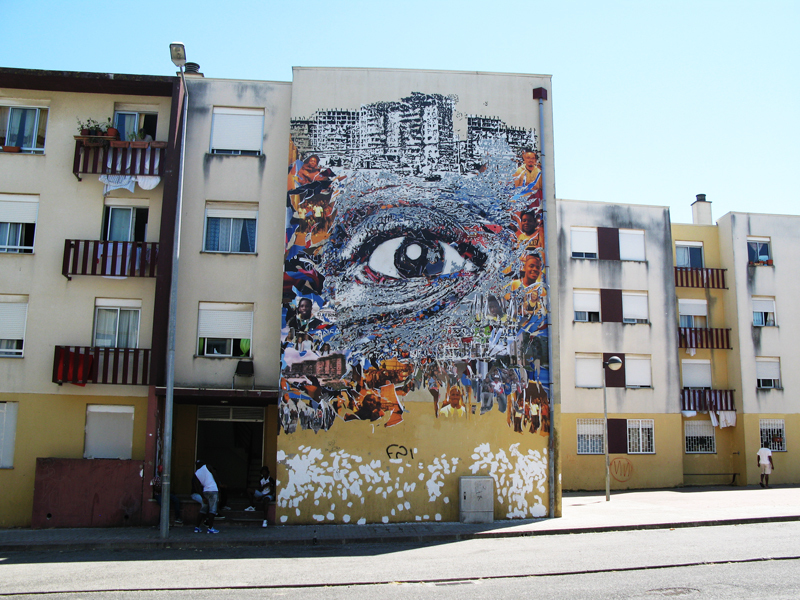 By painting huge murals inspired by the people, the purpose of the project is to change the ‘bad’ image of the neighbourhood, create exchange, bring change, inspire, and improve locals’ environment. 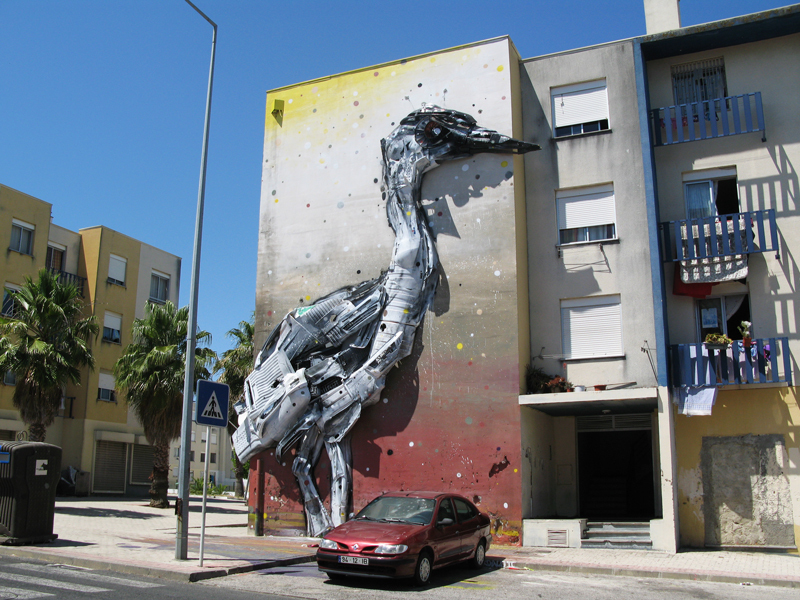 Works include murals by Vhils, MTO, Bordalo II, Odeith, MAR, Smile, Tamara Alves and many more. 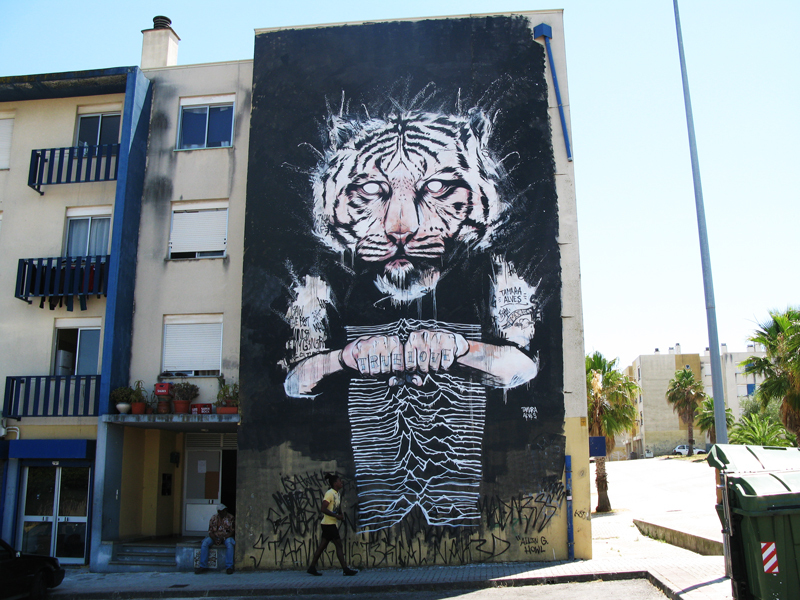 The social impact of the project so far gas already proven its success, and will be extended to 40 more murals, making Quinta do Mocho one of the largest outdoor galleries in Europe. The piece I’ve chosen to paint there is the second one of the series ‘Beyond the Concrete’ (started in Cyprus) which animate buildings. It is my largest piece to date, with a height of 14m. 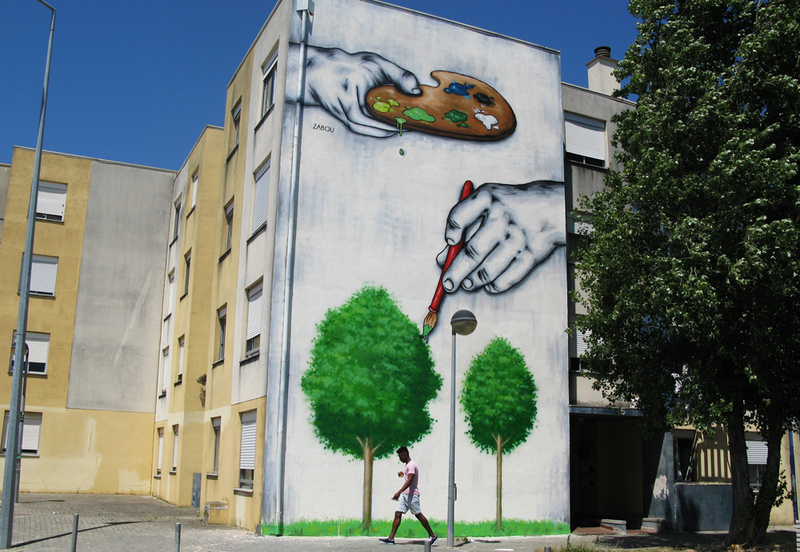 It shows two hands, one holding a palette, one painting trees on the bottom of the building with a brush. 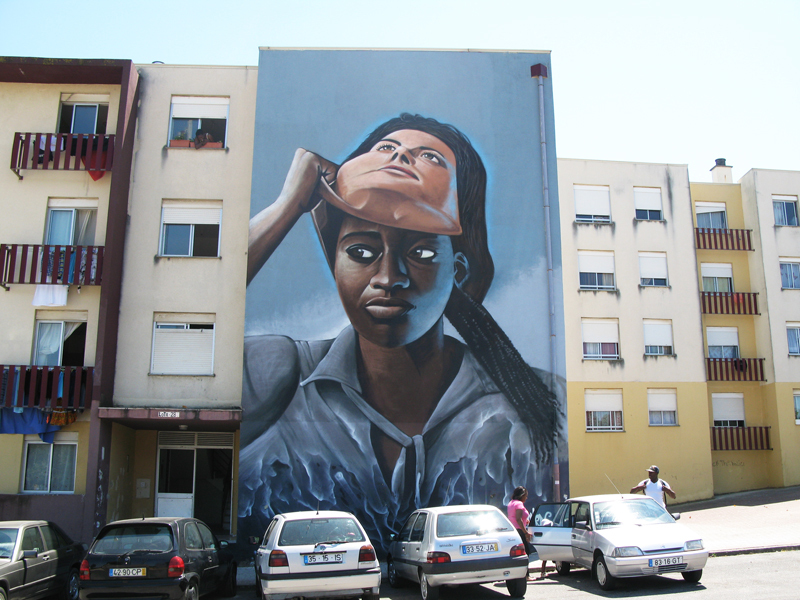 Entitled ‘Trompe l’oeil’, this mural is about being more than just a blank bloc of concrete. 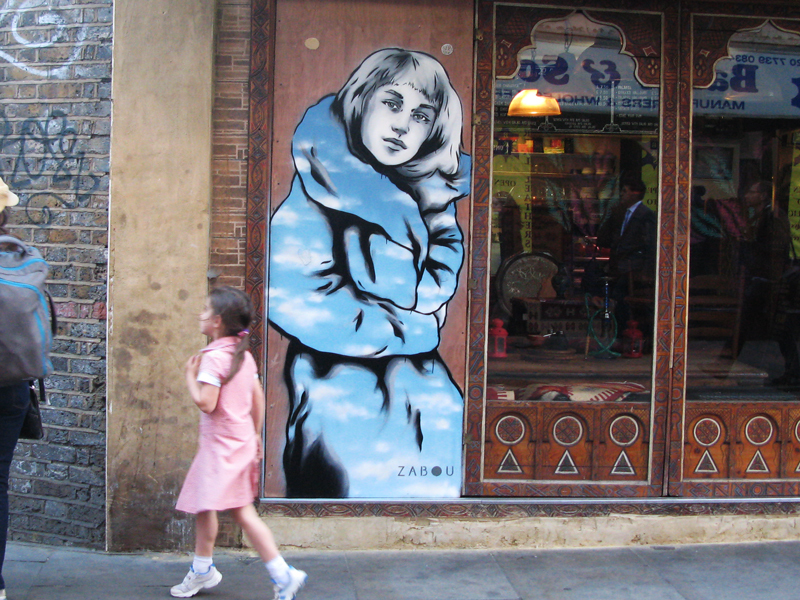 About becoming something else through street art. About the place and lack of nature in urban environments. 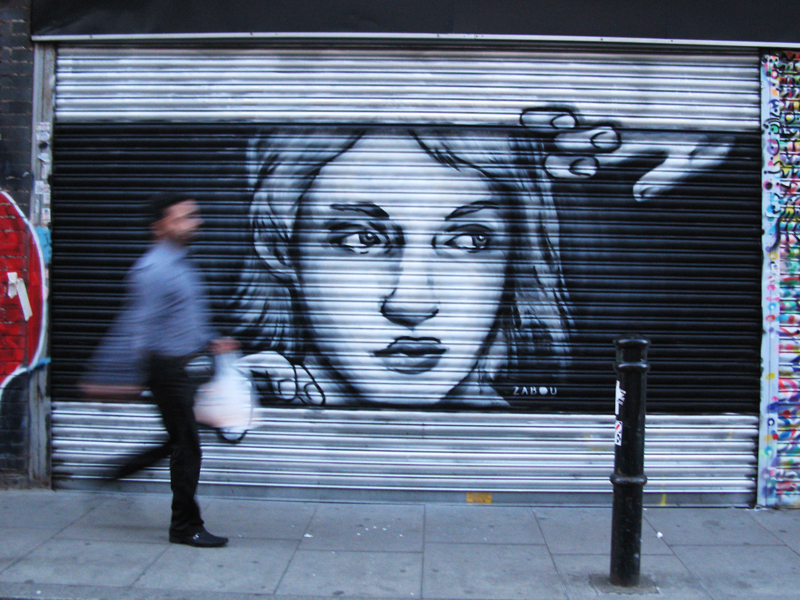 If you’ve been walking around Shoreditch lately you may have noticed a few new characters. If possible, I’m trying to create pieces that interact with their environment (man in the box or woman opening the shutter). 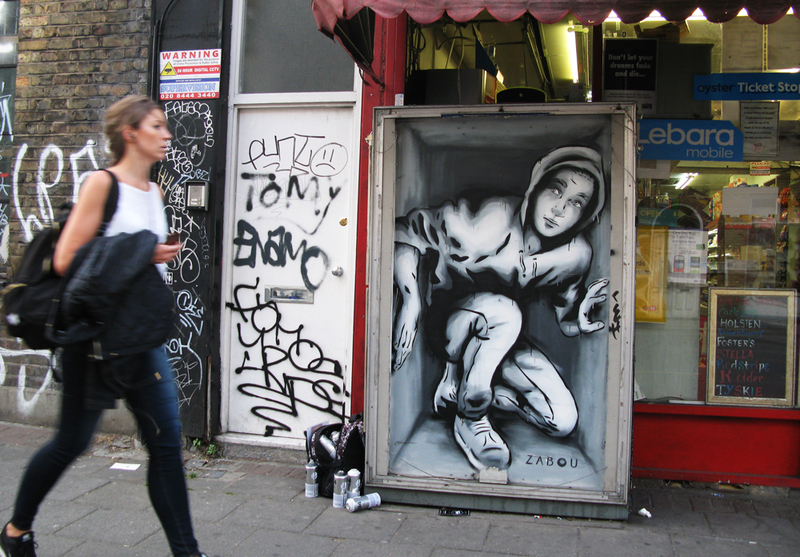 There are two small pieces on Hackney Road and three around Brick Lane. Happy hunting! 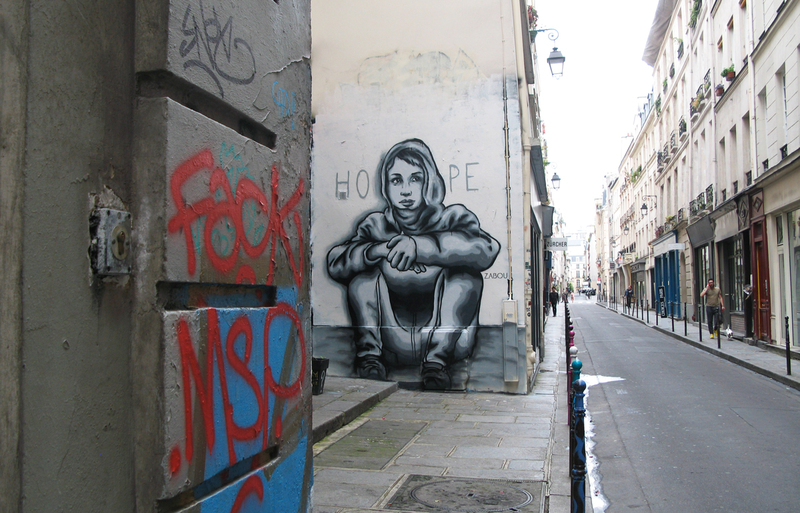 French charity ‘Autistes sans frontières’ invited 70 artists (Jonone, Pichi&Avo, JimmyC, PureEvil, Gregos, RNST, MiccTic, Evoca1 and many more…) to help them raise funds. Each artist worked on the same format: a small tryptique, before the final artworks were auctioned last Thursday at Artcurial in Paris. The auction was a real success and raised a total of 193 300€. I painted this ‘Heart’ canvas (below). 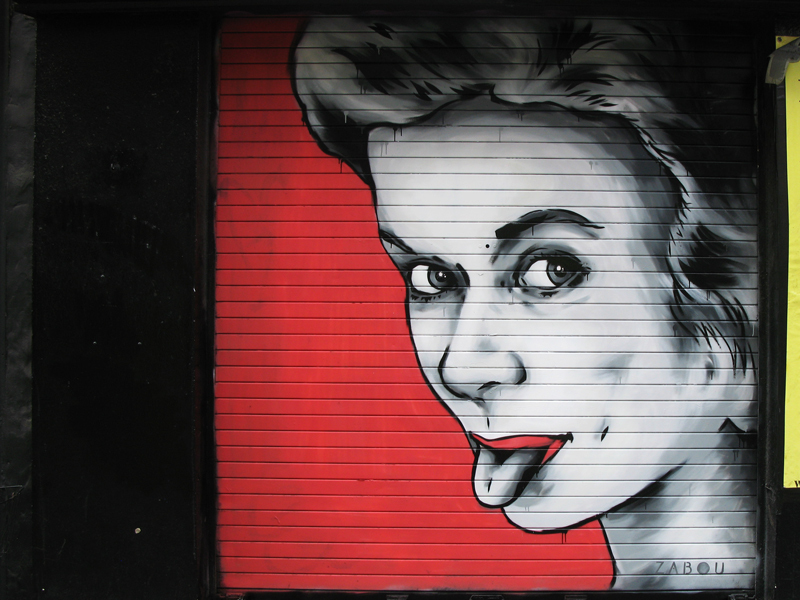 I had the chance to collaborate with French paste-up artist Madame in Vitry-sur-Seine. Madame works with collage of small scale retro magazines and other materials that, once assembled, she prints out in big and pastes up in the street. 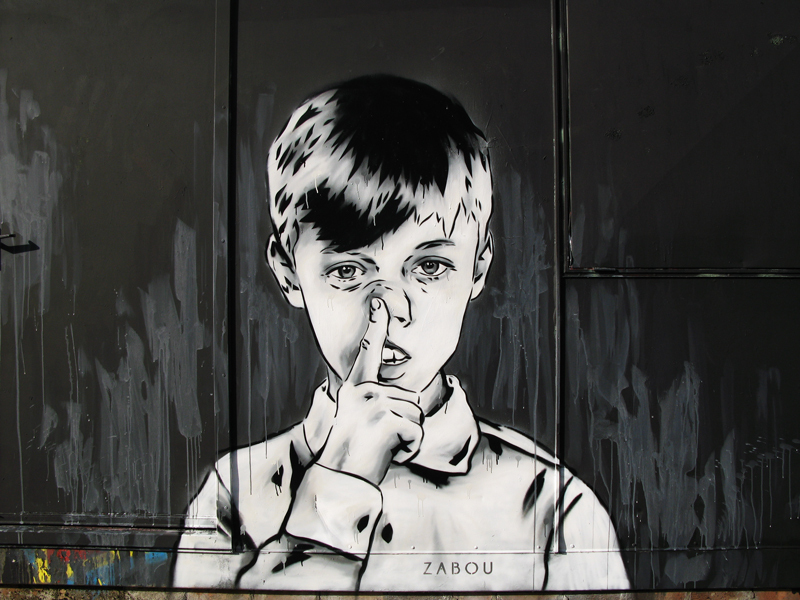 Together we worked on a design that highlights the very short-lived nature of street art: ‘De peinture ou de papier seul le temps était capable de nous changer’ (‘Either paste-up or paint, only time shall transform us‘). “Against the wall (Au pied du mur)” is about the current situation in France and other countries affected by the economical crisis. 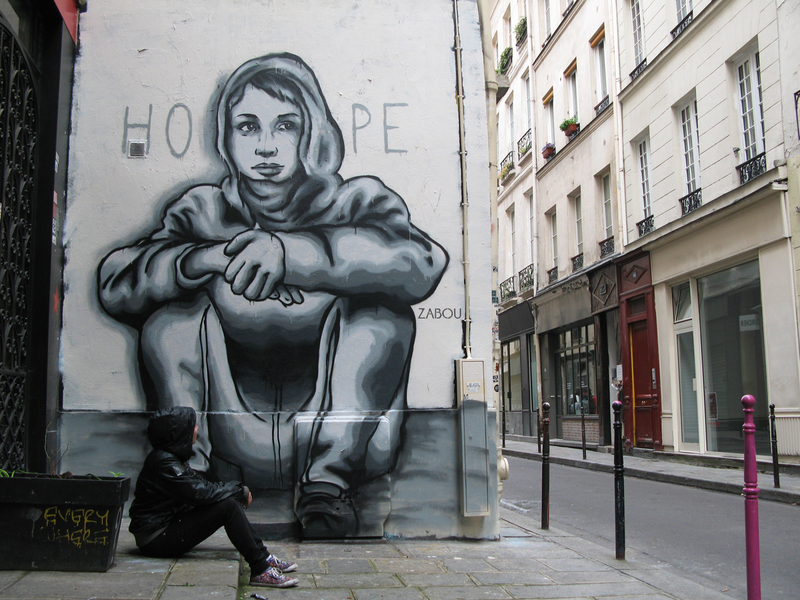 We are waiting for change, hoping for something better, feeling “au pied du mur“, like there is no other way out. 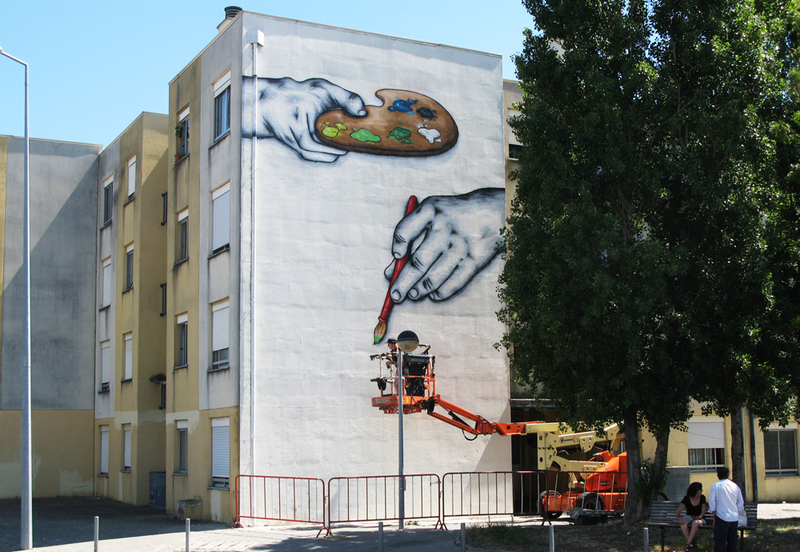 The mural was painted outside Radio Marais, a local French radio which welcomes a new street artist to paint and go on air every two weeks.